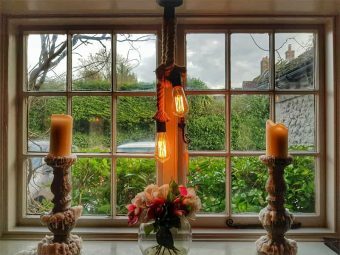 Crackling fires, wooden beams and a mix of quirky and traditionally English decor – I knew I was going to enjoy our Sunday lunch at The George as soon as I opened the door and smelt the roast dinners cooking. 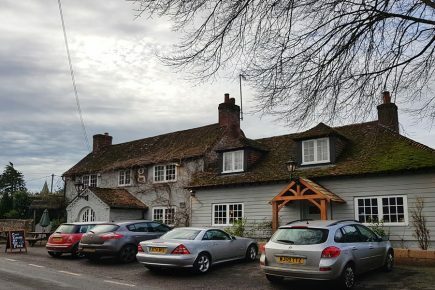 Despite it being less than a 20-minute drive from my home, this was my first visit to this charming old pub. 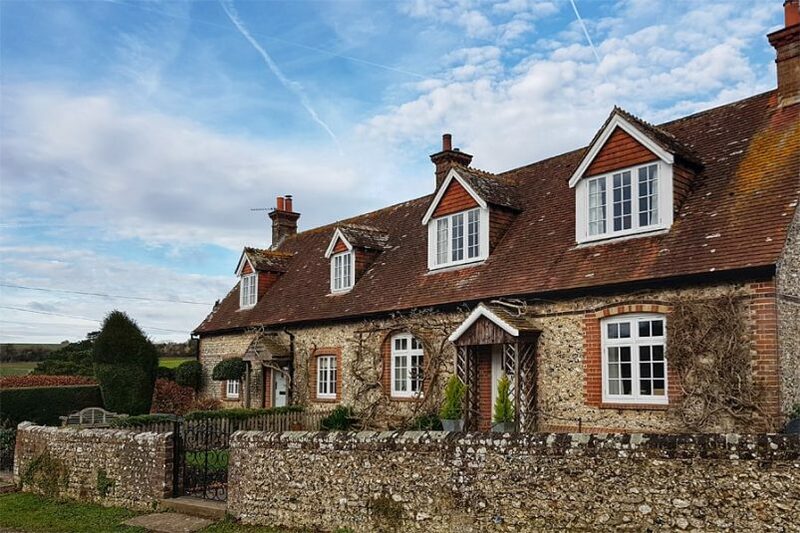 It was built some 170 years in the little village of Eartham tucked away in the South Downs National Park in West Sussex. 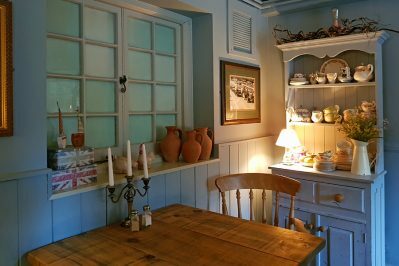 We were lucky to get a table as we’d only rung up on a whim that morning, after the thought of a walk and lunch in the countryside popped into my head, despite it being a chilly, grey winter’s day. 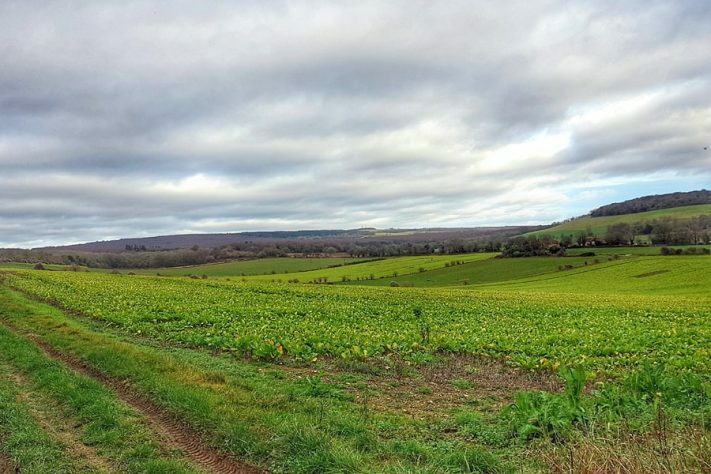 I’d been thinking of visiting Eartham for some time, as it’s close to a guided walk I run from the village of Halnaker to a restored windmill and I’d like to extend the walk or offer a new one in the area. I’m eager to check out all the footpaths that criss-cross the South Downs. In the bar, I was delighted to see a great range of local real ales. 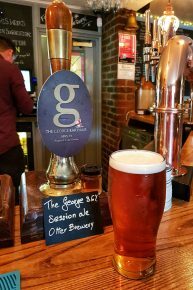 A milk stout from Gun Brewery in East Sussex caught my eye but to go with my roast dinner, I opted for The George’s session ale from Otter Brewery in Devon. I’ll be back to try all the others I’m sure! 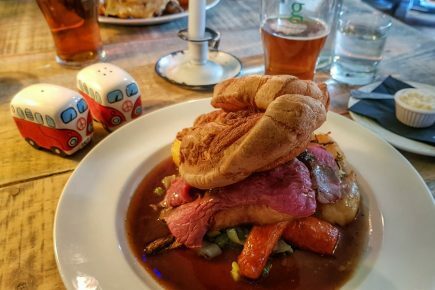 Is this the best Sunday Roast in West Sussex? For lunch, Neill ordered Leg of Duck with all the trimmings from the specials board for £14.95. I went with my favourite Sunday lunch, Roast Sirloin of Beef with Yorkshire Pudding, for £15.95. All the Sunday Roasts come with generous portions of roast potatoes, vegetables and homemade gravy. The beef was cooked to perfection, pink and moist and easy to cut and it came with a good variety of seasonal vegetables and plenty of gravy. This is the best Sunday lunch that I can remember ever having and, being on the wrong side of 50, I’ve had a lot of roast dinners! 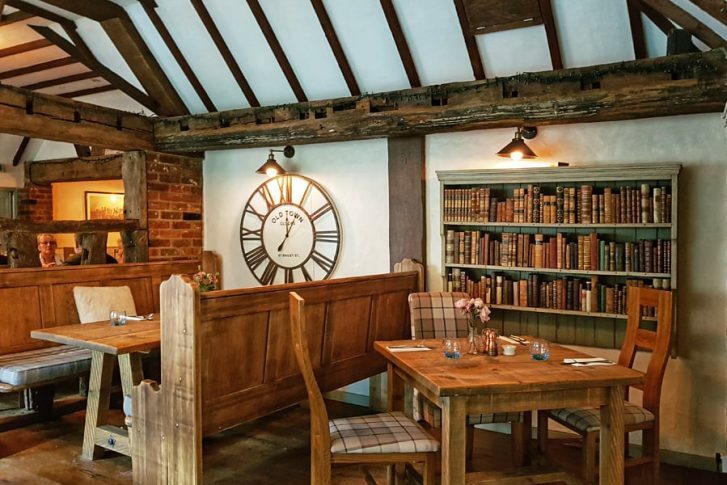 I loved all the interesting details throughout the bar and restaurant, from the quirky salt and pepper pots to the crockery, books, and clocks that adorned the walls, not to mention the cosy glow from the fireplaces – all three of them. 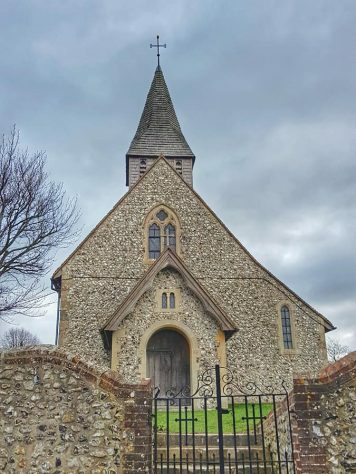 There are some lovely walks nearby, so we headed out for a stroll, popped inside the small but interesting church (dating back to the 12th century) before striding out across the Downs, through fields of turnips and sheep and passing a small vineyard (red eating grapes). We met the friendly owner who was busy replanting a hedgerow with traditional plants such as holly and hawthorn. 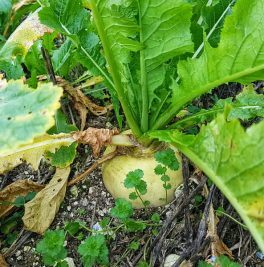 It’s always good to see the land being looked after with thought given to wildlife. Nearby, a Common Toad was looking a little dazed, no doubt having been disturbed by their work but I’m sure he soon found another winter home in the mud. 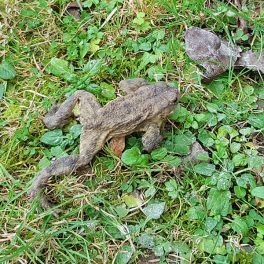 Toads don’t hibernate as such, but they do spend most of the winter in hiding, only occasionally popping out on warmer days. There’s a circular walk from Eartham that we’re going to try another day. It sounds particularly lovely when the bluebells are out. You can find the details here. 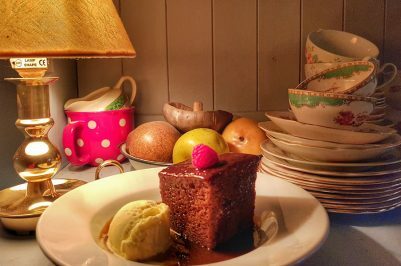 On our return, we couldn’t resist popping back inside the George for half a milk stout and a heavenly sticky toffee pudding. The perfect end to a perfect lunch. 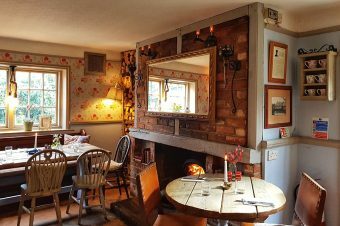 My hubby and I are both eager to return to The George at Eartham, and I’m sure it won’t be long before we take the rest of the family along. 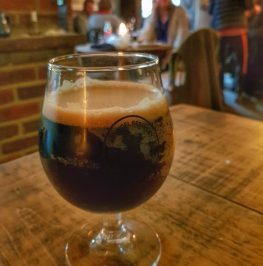 There’s a beer flight of Sussex Ales with my name on it and I’d love to try the George Ale battered fish and chips, rustic tartare and pickled wally. I had no idea what the latter might be, but I should have guessed, it’s a gherkin. Lovely to walk around and have a Sunday roast at a pub. Looks delicious and the scenery lovely and serene. A great idea to have a walk to let the food settle and finish off with some pudding! I’ve not done it before but it worked out rather well. I felt I’d earned my pudding!